We had such a blast performing for you and we hope you had a great time! Thanks to all the family and friends who came out to support us and a special thank you to Zack Wajsgras for taking such wonderful pictures during the concert. If you want to see more of the photos of the concert--check out the gallery here. Also, stay tuned for updates on concert videos if you missed your chance to go to the concert or if you just want to re-live the experience. We look forward to seeing you next semester at our Fall Concert! What was your favorite part of the show? What was your favorite song? Comment below! We would love to hear your thoughts. We saved the best, and the oldest for last. Our last Senior Spotlight goes out to our most super-senior, Chip "not Dale" Barker. Chip, a Electrical Engineering major, has been in the group for 10 semesters now. Chip is always the member who has food at practice, and no, he won't share it with you! Passionate about dynamics and making sure we watch the music director, Chip's dedication to MEMO will surely be missed! Next spotlight is on our Wonder Woman, Julie Vasquez. Julie is known for her powerful vocals and impressively accurate African inspired chant in "He Lives in You." Julie can be found building houses, cycling at the gym, or spending long hours designing in the architecture studio; somehow she does it all and still has time to frequent Hokie House on the weekends. She has been such a vital addition to this group since coming in as a freshman as she has sang everything from beautiful soprano to powerhouse tenor. Her creativity, amazing choice in shoes and her musical ear will be sorely missed! Today our spotlight is on Erin Collier-a.k.a "Miss Collier," "Molly Weasley" and "the token ginger." Erin joined the group as a soprano during her first semester of freshman year. Known for being the biggest Harry Potter fan in her hometown of Chatham, New Jersey, Erin brought magic to the lives of everyone in the group. Her big heart and dedication to Mixed Emotions have been part of the backbone of this group since she got in. Erin's laughter at inappropriate times, willingness to always take a "shot-for-shot", and kind spirit will be greatly missed. Although she has a knack for going commando and getting lost, we can't get enough of our free spirited sweetheart! Our spotlight today is on Erick Emmanuel Aloysious Gonzaga "Enrique Iglesias Inigo Montoya Esteban Edmund Eduardo Silencio" Enciso "puede". Erick has been in the group since the first semester of his freshman year and has been one of the groups' music directors since he was a sophomore! Possibly getting the best workout on stage, Erick can always be seen on the side of the arc conducting our songs with flapping arms and huge sweeping motions. 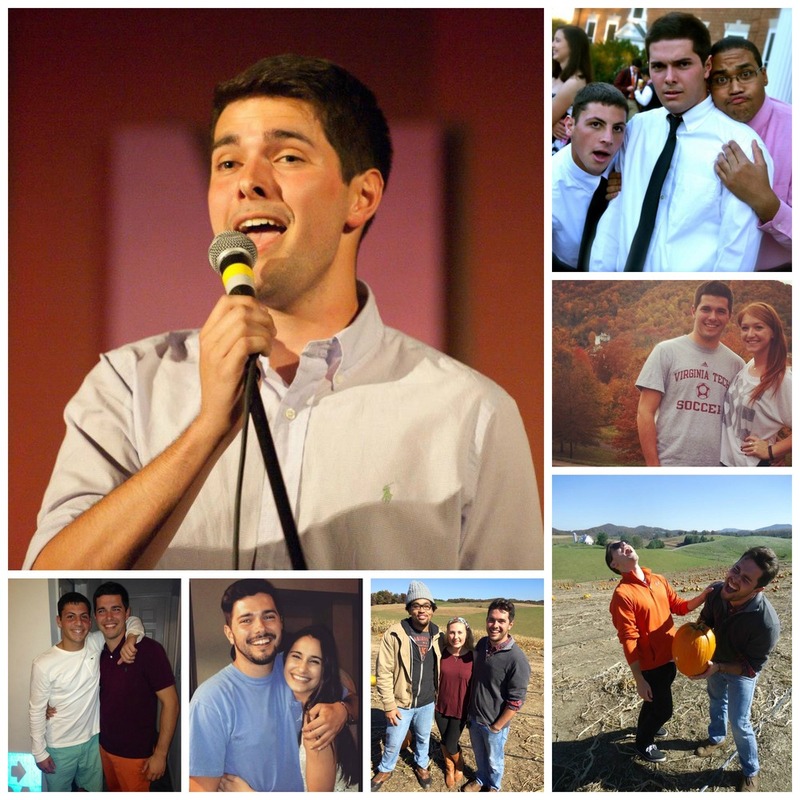 Erick has been an integral part of the group because of his great ear and huge heart. I don't know what we will miss more, Erick or his delicious sausage bread. Regardless, the group won't be the same without our favorite Filipino friend next year! Next up in the spotlight is senior Nick Carr! He came into the group at the beginning of his sophomore year and will forever be considered the "power bass," sure to hit the lowest notes in every song. Nick, aka "Coach", "Nicola", and "He Who Wants Your Money" is always full of smiles and positive encouragement for all of us. Everyone knows Nick is full of wanderlust and has a strong passion for Virginia Tech's Taaluma Project which helps the Kenyan educational system. Mixed Emotions will definitely miss our "dad" and "personal chauffeur" next semester! Starting off the senior spotlights with our fearless leader, Finn Dahl! Also known as "Dahl-finn" or "Finnerdeen," he has been in Mixed Emotions since his first semester of Freshman Year. From serenading fangirls to busting his signature moves during performances ,Finn has always been a huge part of our family. Tickets are now available online! Get your tickets today!